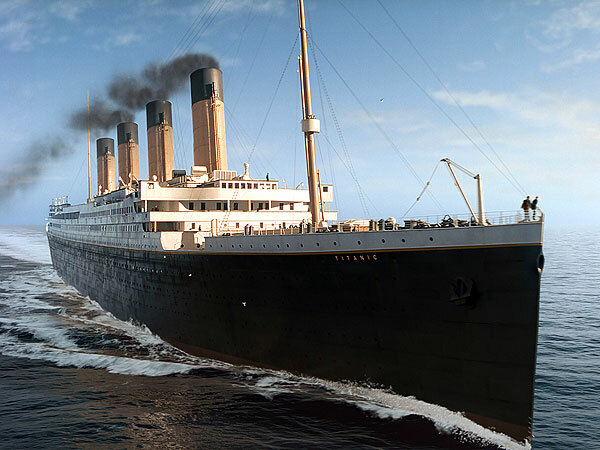 On April 14, 1912, the world’s biggest ship, the RMS Titanic, struck an iceberg, and two hours and 40 minutes later, sank to the bottom of the North Atlantic with over 1500 people with her. The lovely lady lay silently at the bottom of the ocean for 73 years before a man named Dr. Robert Ballard, and his team of scientists aboard a ship, discovered her wreckage lying on the bottom of the ocean. When the crew returned back to land, they had news to share with the world. 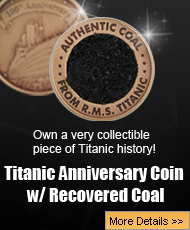 The world caught Titanic fever, and has had it ever since! However, 2015 marks the 30th anniversary of Titanic being found, and to celebrate it, here are 5 more very rate pictures of this long lost ship that has captured the world and will not let go. The RMS Titanic was only on her voyage for a total of four days. 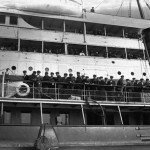 There are very few photographs that exist of the ship itself while she was on her ill-fated trip. However, this particular image is of the stern of the ship. 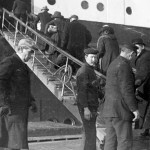 The passengers that hung around the stern of the Titanic were from the Third Class, and it is interesting to see them enjoying the sea air. The Titanic left Southampton, England, on April 10th, 1912 at exactly noon. The ship was scheduled to make two stops, and then cross the big ocean to go to New York City. That evening, Titanic dropped anchor in France, and from there, she picked up more passengers including the infamous Margaret Brown, also known as the Unsinkable Molly Brown. 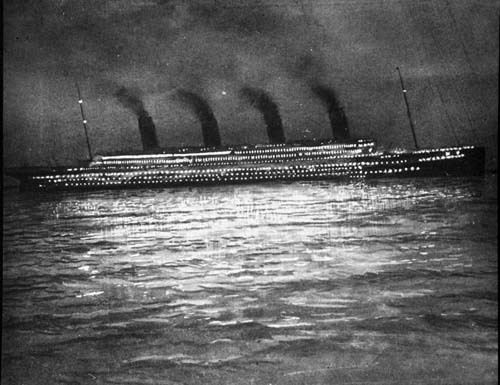 From the shore, one person captured a very rare image of the Titanic at night just as she was leaving Cherbourg. What makes this image so rare is the fact that it is the ship with all her lights on, heading away from France, and on her way to Ireland. The RMS Titanic was a huge ship, so big that it could not dock anywhere. However, in order to get the passengers to her, small ferries had to be used. Here is a very rare image of one of these ferries as it pulled up along side the Titanic. 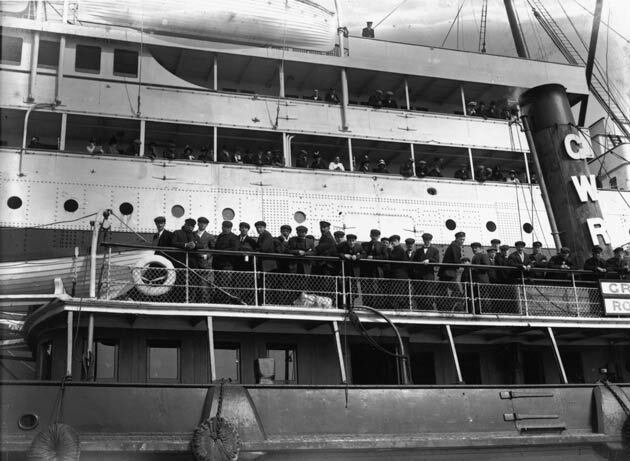 The picture had to be taken from the ferry itself, and it caught a few passengers watching as those passengers disembarked. 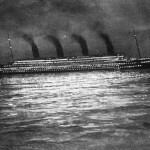 What do you all think of very special image of the Titanic one of the few days she was still above the water? For those of you that saw the Titanic movie that came out in 1997, this scene should look familiar to all of you.Remember when Rose, Cal, and her mother were boarding the ship and they went up that gangplank? 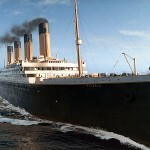 Well here is the real 1912 equivalent that inspired James Cameron to add a boarding scene in his movie. 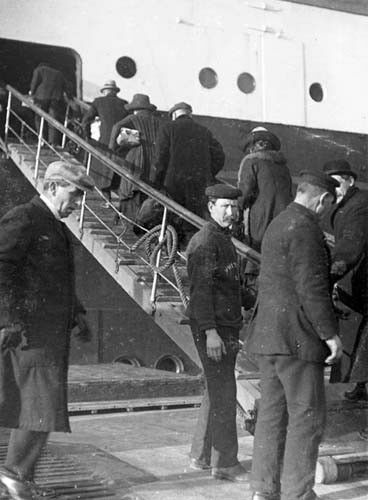 Not only does the camera capture the passengers going on board the Titanic, but it also captured the images of some of the crew members too. 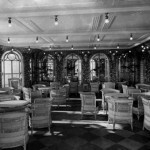 There were many places that offered Titanic’s passengers the change to enjoy the air of fine dining. 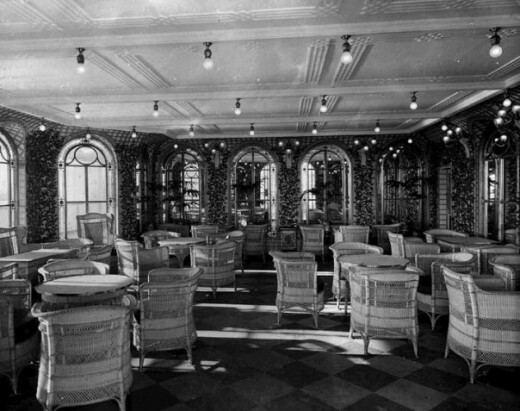 This rare image is of the Titanic‘s Cafe Parisien. What made this dining area different was it served lighter dishes, and was more ideal for people who wanted to eat a smaller lighter meal in the middle of the day. The area was bright and airy, and had beautiful wicker furniture. 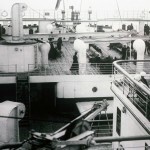 So, these are the last five of the 10 rare images from the long lost Titanic ship. Doctor Robert Ballard made the world fall in love with the beautiful ship when he found her rustling remains after 73 years under the water. 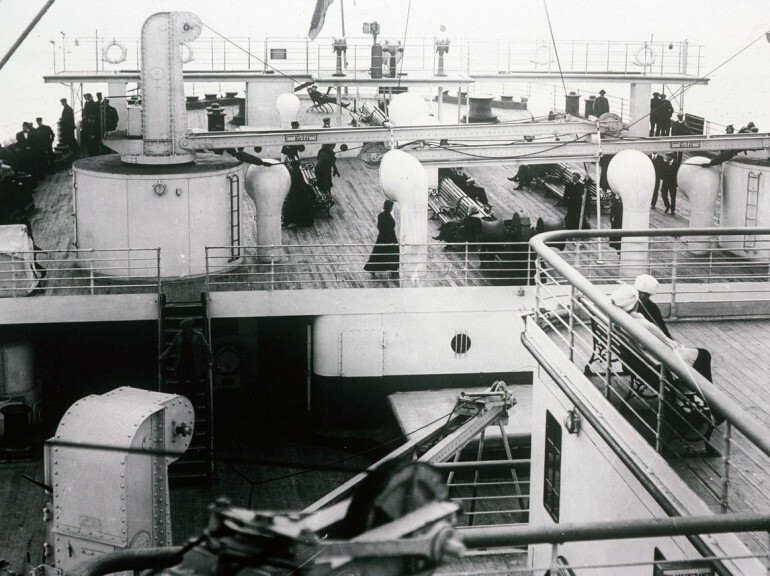 Because of her very short life, there are very few image of the Titanic that exist out there, but the ones that are out there show just a tiny glimpse of what life was like in 1912. Though over 1500 people died on board her, these rare images are just part of her legacy that help us all remember that the greatest ship in the world did exist, and all we have left of her are rare images like these that must forever be treasured. With images like these, the Titanic, and her passengers, will never be forgotten.